Thanks to all who supported NNECOS in 2018! Please reference the 2019 Support Levels Document linked below for 2019 opportunities. At this time, we are accepting requests for 2019 corporate membership, 2019 two-meeting exhibit commitment, and 2019 spring meeting participation. Information about requests for 2019 annual meeting exhibits only is expected to be made available in mid-January of 2019. 2019 Support Levels Document Now Available! 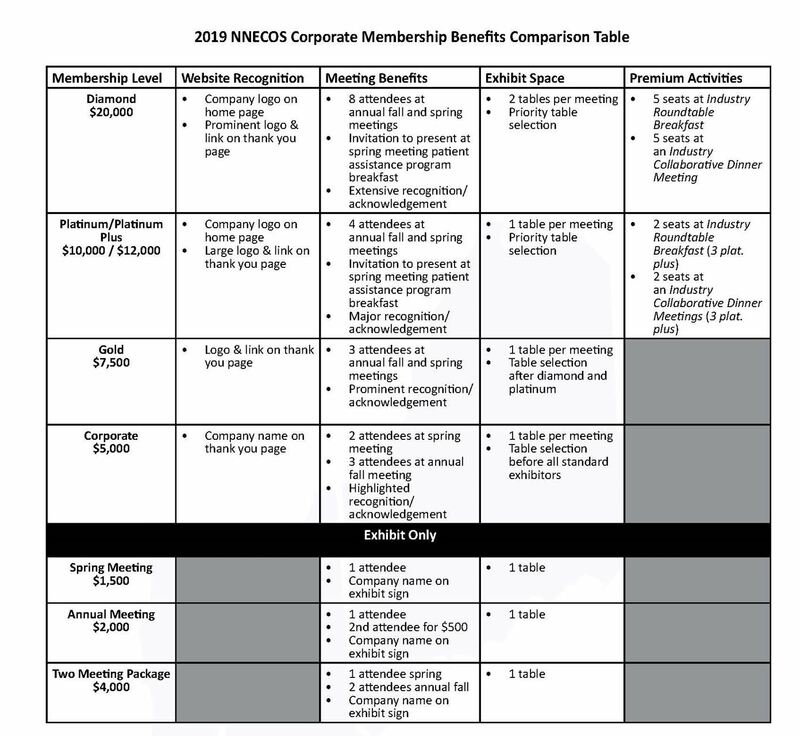 Corporate membership fees and exhibit fees are non-refundable. Exhibit/display space at meetings where it is offered. Attendance for one company representative at the meeting (registration paid, optional meals/activities and other expenses are individual responsibility; attendees MUST pre-register for the meeting online). Exhibitors may purchase one additional registration for the annual fall educational meeting for $500 per registrant. If you are interested in becoming a NNECOS supporter, please select the type below and fill out the application that follows. Thank you!! Corporate Membership - Platinum - $10,000.00 (USD) Subscription period: 1 year, on: January 1st No automatically recurring payments Payable by check or EFT. Corporate Membership - Gold - $7,500.00 (USD) Subscription period: 1 year, on: January 1st No automatically recurring payments Payable by check or EFT. Corporate Membership - $5,000.00 (USD) Subscription period: 1 year, on: January 1st No automatically recurring payments Payable by check or EFT. The Industry Roundtable Breakfast agenda focuses on the issues of access to oncology care and quality of oncology care, and NOT on selling of product or promoting any particular company. Hosted annually by the NNECOS Board of Directors in conjunction with the annual fall meeting. Invitation to one in a series of annual dinners hosted by a NNECOS Physician Leader and one or more additional leaders/board members. The purpose of these dinners is to enhance the collaborative relationship and integrate efforts to support NNECOS’ mission on a range of issues including access to cancer care, cancer research and education of cancer care professionals. Two platinum/diamond companies will be represented at each dinner, with two or three participants from each company. Diamond members may elect to participate in one dinner with five participants or attend two dinners, two attendees at one and three at another. NNECOS may host two concurrent dinners with a minimum of one physician leader at each table.